Now here’s a theme that WORKS! Its excellent, love the 3 column fluid layout, the green isn’t my fav, I would love if the color was optional, like 3-4 to choose from, but its very good nonetheless. A great modification of a great theme, one question though, I am using IE and the left hand column is appearing on the right hand side obscuring much of the content. Is there anyway to fix this or is it just IE? 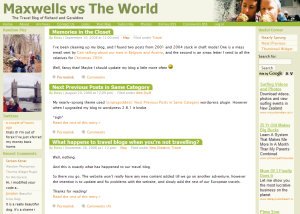 I love Almost Spring, and I needed a three-column layout for one of my blogs, so this is perfect! My only question is about the green bar across the top. If one has sub-pages, these appear beneath the green bar, screwing up the layout. Is there any way around this? Thanks! Hey Guys, I’m glad you like my theme. Mike: I use Opera, Firefox, and IE 6 to test my site (and thus this theme) and It all seems fine. So I don’t know why it would screw up in your browser. Could you tell me what version of IE you are using? and what your screen resolution is? Have you tried force reloading the page (hold down shift while pressing the reload button)? incase you came to the site when I was fiddling with it. Anyway guys, today im leaving for South America for two months, so forgive me if my replies are not so forthcoming. Maybe I’ll get it worked out by the time you get back – thanks for the tip! Got it! I needed to modify the wp_list_pages code to exclude the relevant pages. Now “Nearly Sprung” is working perfectly for me…so far! Thanks! Oh, I meant to mention, also. The link at the bottom for the “Design by” isn’t laid out correctly. Looks like perhaps you depend on a plugin? Although I notice the same problem on this page too. Hover over the name, you’ll see the link is “http:///” — not too useful! It works great but one thing — it caused photopress plugins not working anymore. Numbered and bulleted lists display incorrectly in IE 6. The spacing between items is off, and with numbered lists it only repeats #1?